++*Friday, 21 September 2012, 8-9 p.m., at the Bantry Library “Culture Night 2012,” in Bantry. This was a book reading and public discussion in the library conference area. ++*Saturday, 22 September 2012, 9-10 p.m., at Casey’s Hotel in Glengarriff, with traditional music, book reading, discussion, and a preview of memorial plaque that was dedicated at Galley Head the following day. This was a party at which the memorial plaque was displayed for the first time. ++*Sunday, 23 September 2012, 3:30-4:30 p.m., at Galley Head Light House at Galley Head point south of Clonakilty, the unveiling and dedication of the Flying Tiger 923 memorial plaque to be mounted at the light house. This was an outdoor event and that included the introduction of guests and dignitaries by light house keeper Gerry Butler, a formal benediction, a reading of “flight over Galley Head” from Born Again Irish, reading of messages from abroad, thank yous and acknowledgements. The memorial plaque will become a part of the Light House property and an official part of its history. 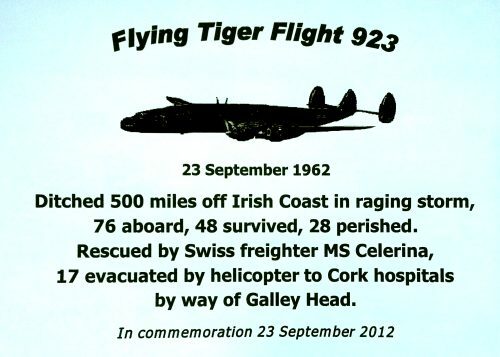 ++First, the crash of Flying Tiger 923 is considered an “Irish air disaster” due to its happening off the western coast of Ireland and was headed to Shannon, Ireland for refueling. ++Of Irish air crashes, Flying Tiger 923 is considered to be one of the 10 most horrendous air disasters in its history. ++Seventeen of the Flying Tiger survivors were airlifted by helicopter from the Swiss rescue ship, which was by then only eight miles off the coast at Galley Head point. They were flown by way of Galley Head to Cork Airport and taken to various Cork hospitals. Many participants in the rescue operation fifty years ago are alive and active and keenly interested in the historic details. Among them are members of the emergency rescue team (EMT), medical service providers and boatmen. In addition, to the events above, several smaller book readings were held west of Bantry. *Wednesday, 19 September 2012, 4-5 p.m., Manning’s Emporium at Ballylicky, a book reading and discussion. *Thursday, 20 September 2012, 4-5 p.m., Bay View Boutique Guest House, Glengarriff, a book reading and discussion. The book referred to at all of these events is Born Again Irish: The Journey That Started With an Airplane Crash. It is written by Flying Tiger 923 survivor and author Fred Caruso (aka O’Caruso) who lives in Glengarriff, Ireland and Eagle, Colorado. Details on the book are at: http://www.cgibooks.com/bai/. This entry was posted in Uncategorized and tagged 50th Anniversary, crash of the Flying Tiger, Flying Tiger 923. Bookmark the permalink. Please read the following at the Memorial Event. Thank you…!!! On this 23rd of September, 50th Anniversary of our tragic accident that took so many lives; I just want to make my presence felt through these lines. Since I can’t be there in person be sure my mind and spirit will be there with you. My name is Raul Acevedo Sr., I am a survivor and for the Grace of God I am still alive, “50 years later”. The event that you are holding today is thanks to the hard work and diligence of Mr. Fred Caruso, our friend and fellow survivor, to whom I send all my respect and congratulations.